By Samuel Ramani in The Diplomat: On May 24, 2016, the Korea Times reported that senior officials from North Korea’s governing Workers’ Party of Korea (WPK) and the Communist Party of Cuba held talks on strengthening ties between Pyongyang and Havana. 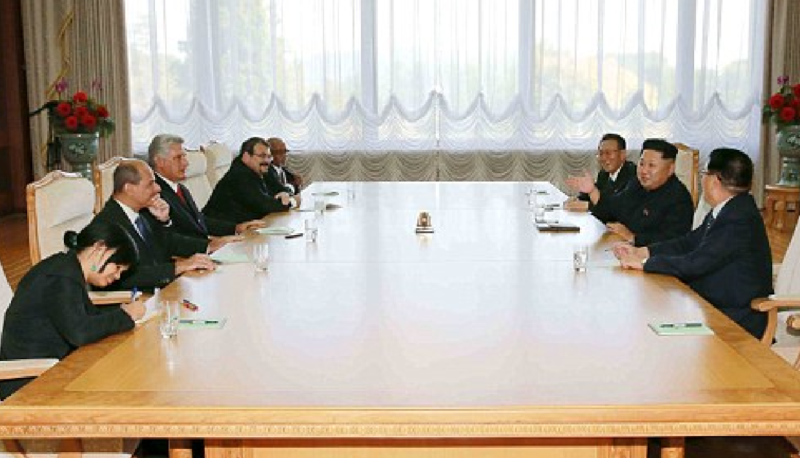 This meeting followed Cuba’s congratulatory rhetoric toward Kim Jong-un after his re-election during last month’s historic Workers’ Party Congress. That congress was the first such-meeting since 1980. While relations between North Korea and Cuba have been close since the Cold War, this revelation is an embarrassing blow to the Obama administration’s attempts to normalize relations with Cuba. North Korea’s close ties to Cuba can be explained by a shared normative solidarity against American values and perceived American imperialism. This ideological bond is formed out of historical experience and has occasionally manifested itself in symbolically significant shipments of arms and manufactured goods. These trade linkages persist to this day, despite tightened UN sanctions and strides towards a less confrontational U.S.-Cuba relationship. Over the past half-century, Cuba has been one of North Korea’s most consistent international allies. This alliance has caused Havana to resist diplomatically recognizing South Korea, despite growing economic cooperation with Seoul. Cuba’s firm pro-Pyongyang stance has deep ideological underpinnings, stemming from both countries’ shared Communist experiences. In 1960, Che Guevara visited North Korea, praising Kim Il-sung’s regime as a model for Fidel Castro’s Cuba to follow. While both regimes preserved authoritarian systems and the trappings of a planned economy, their ideological synergy did not translate into convergent governance trajectories, as Guevara predicted. As Wilson Center expert James Person argued in a July 2013 BBC article, North Korea wanted to avoid Cuba’s dependency on Soviet weaponry following Khrushchev’s retreat from confrontation during the Cuban Missile Crisis. This resulted in North Korea transitioning toward a military-first policy, to the detriment of the country’s economic development. Meanwhile, despite visiting North Korea in 1986, Fidel Castro avoided creating a cult of personality resembling Pyongyang’s, as he felt that statues erected in his honor were incompatible with the Soviet Marxist-Leninist principles that he adhered to. Despite their divergent development courses, both countries have remained close allies to this day, and there are signs that the bilateral relationship has strengthened further under Raul Castro’s rule. Panama’s interception of a North Korean ship in 2013 containing Cuban arms concealed under bags of sugar represented the most significant Havana-Pyongyang commercial linkage since the 1980s. Despite Cuban attempts to downplay the controversy, Panama’s foreign minister regarded this action as just part of a much larger Cuba-North Korea arms deal. U.S. Ambassador to the United Nations, Samantha Power, also condemned Cuba for violating international sanctions. The U.S.-Cuba normalization has done little to shake Cuba’s close ties with North Korea. 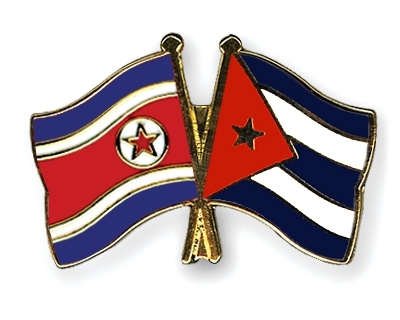 In March 2015, Cuban Foreign Minister Bruno Rodriguez declared that Cuba maintained solidarity with the North Korean regime, despite Pyongyang’s increased international isolation. Rodriguez justified his stance on the grounds that Cuban foreign policy is based on upholding just principles and resisting Western interference into the internal affairs of countries. While leading North Korea expert Andrei Lankov interpreted these statements as proof that Cuba’s criticisms of U.S. imperialism would continue unabated despite the normalization, some NK News analysts have contended that Cuba’s show of support for North Korea may be more rhetorical than substantive. Cuba is mentioned only sporadically by the North Korean state media, and in a limited range of contexts. This suggests that the Obama administration’s Republican critics may have overblown the strength of the Havana-Pyongyang bilateral linkage. Even if the extent of the relationship has been periodically exaggerated, Cuba’s September 2015 and May 2016 reaffirmations of an alliance with North Korea suggest that the ideological partnership remains alive and well. South Korean Foreign Minister Yun Byung-se’s visit to Cuba for the Association of Caribbean States (ACS) summit on June 4 and Seoul’s open calls for normalization with Cuba are unlikely to cause illicit trade between Cuba and North Korea to diminish or become more covert. This is because the symbolic significance of arms shipments and small-scale trade deals between the two countries still outweighs the economic benefits Cuba could glean from enhanced South Korean capital investments. Despite the immense international controversy resulting from Cuba’s 2013 arms sales to North Korea, sporadic trade linkages between the two countries have continued largely unhindered. In January 2016, Cuba and North Korea developed a barter trade system, which officially involved transactions of sugar and railway equipment. According to Curtis Melvin, an expert at the Washington D.C.-based U.S. Korea Institute, barter trade is an effective way for Cuba and North Korea to evade international sanctions without depleting their hard currency reserves. Cuba’s use of sugar as a medium of bilateral trade has close parallels with Myanmar’s historical use of rice in exchange for North Korean military technology assistance. This form of trade has been vital for the North Korean regime’s survival in wake of the Soviet collapse and more inconsistent patronage from China. While Cuba’s ability to use North Korean railway equipment remains unclear, NK News reported in January that Kim Jong-un was planning to modernize the DPRK’s railway networks, This development initiative could result in heavy industry production that can be bartered to Havana. While trade in civilian goods between Cuba and North Korea appears to be on the upswing, trade in illicit arms continues to be the most symbolically potent and controversial form of bilateral trade. A 2013 Stockholm International Peace Research Institute (SIPRI) report noted that a large number of North Korean arms brokers speak fluent Spanish. This language training demonstrates the importance of Cuba as a trade destination for the DPRK. The SIPRI report notes that Cuban arms dealers are especially attractive because they can deal with North Korea with a sense of impunity. This contrasts sharply with a British arms dealer who faced prison time in 2012 for purchasing North Korean weapons. While the 2013 incident remains the most recent confirmed incident of weapons trading between Havana and Pyongyang, recent revelations of a lost U.S. Hellfire missile turning up in Cuba have sparked fresh concerns about a revival of the long-standing arms trade. Cuba has consistently insisted that its arm shipments to the DPRK are for repair purposes, and therefore do not violate sanctions, which only ban one-way arms transfers. But Mary O’Grady of the Wall Street Journal recently speculated that Cuba’s intelligence sharing and close cooperation with the DPRK constituted a highly pernicious blow to the prospects of U.S.-Cuba normalization. While the Obama administration has removed Cuba from the state sponsors of terrorism list and taken a big stride toward lifting the Kennedy-era embargo on Cuba, Havana’s continued cooperation with Pyongyang is an alarming blow to the normalization process. The current linkage between anti-Americanism and the Cuban Communist Party’s regime security makes a shift in Havana’s North Korea policy unlikely in the short-term. It remains to be seen if Castro’s planned retirement in 2018 will take Cuban foreign policy in a more pragmatic direction, and allow South Korean diplomatic overtures to finally be successful. 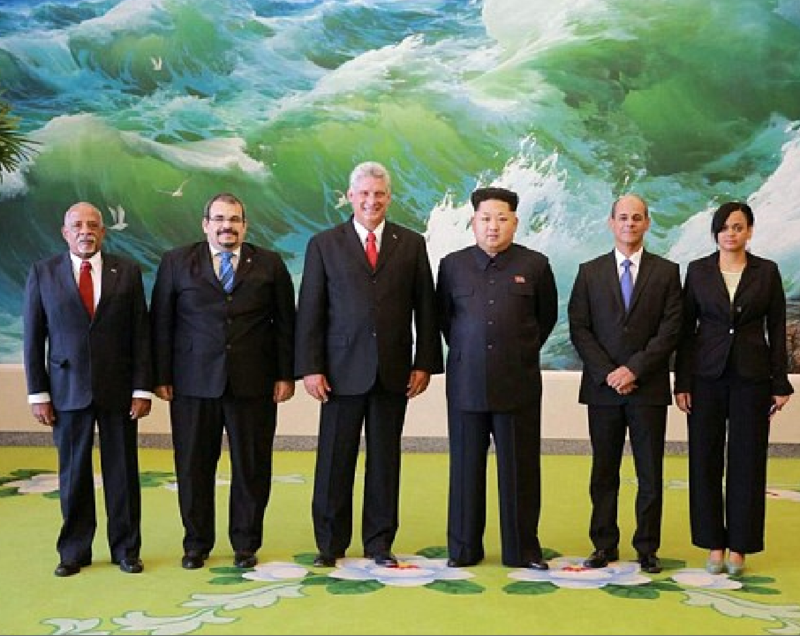 Vice President Miguel Diaz-Canel meet with Kim Jong Un in Pyongyang over the world’s widest conference table. This entry was posted in Blog and tagged International Relations, North Korea - Cuba Relations. Bookmark the permalink.